Concussion is a brain injury and must be taken extremely seriously to safeguard the short and long term health and welfare of all players. The majority (80-90%) of concussions resolve in a short (7-10 days) period. The recovery time is longer in children and adolescents, and because their brains are still developing, a more conservative approach needs to be taken with them. While symptoms may resolve, the brain takes a bit longer to recover fully so this needs to be factored into the recovery protocols. • Possible increased risk of long term health consequences e.g. mild cognitive impairment or degenerative brain disorders in later life. • Further concussive events before recovery in adolescents while very rare and poorly understood, can be FATAL, due to severe brain swelling. This is known as second impact syndrome. The standard in sideline assessment is the Concussion Recognition Tool (CRT). Every sports trainer should have easy access to this in the event of a concussive event so they can make the right decision for the player’s welfare. Any player with suspected concussion should be IMMEDIATELY REMOVED FROM PLAY, and should not be returned to activity (training or playing) until they are assessed medically. NOT consume alcohol and keep well hydrated. NOT drive a motor vehicle. NOT be left alone, and be woken every 2-3 hours during the night to ensure they are well. Rest from all activity until symptoms recover. A player should consult with a medical professional on a graduated return to training and playing. Medical clearance required to return to play. Player to submit medical clearance to Club. Different sports leagues may have different protocols set in place. Many leagues will require reporting of concussive events to the governing body and will also require medical clearance prior to return to play. It is best to contact your league and ask them specifically what their protocols are for managing player concussion. The AIS has an excellent website with loads of information on concussion and is a terrific guide. It is definitely worth checking this out. 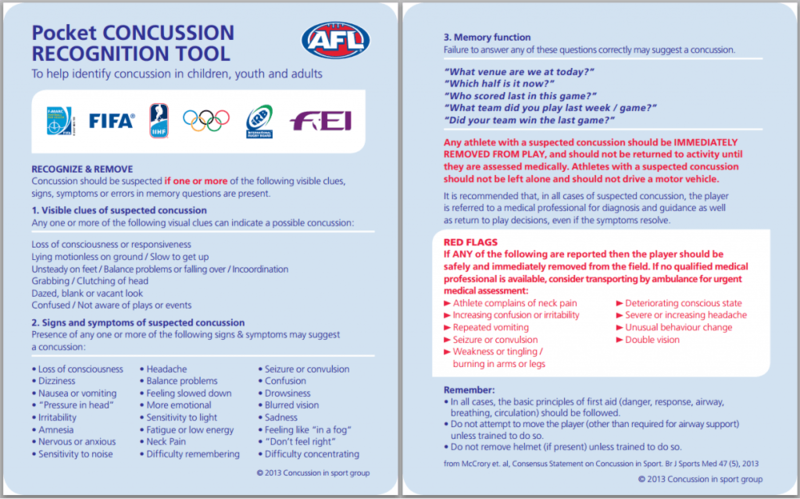 Follow the below links to information created by the AFL regarding protocols to follwo regarding a concussive event.